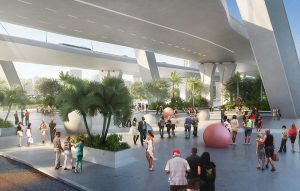 The $802 million redesign of I-395, SR 836 and I-95 in downtown Miami will be a major headache for drivers, but renderings show just how stunning the end result will be. 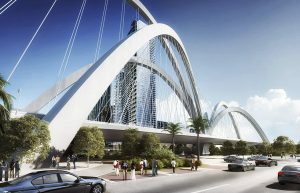 The arched bridge will be Miami’s signature feature as its soars over the downtown area. 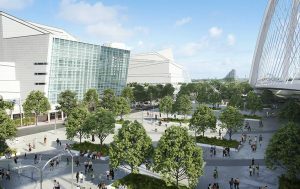 The larger context is it is part of a multidecade transformation of the downtown area. 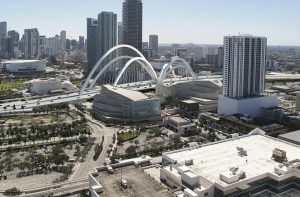 Consider in the last few decades that Adrienne Arsht Center for the Peforming Arts, the Frost Science Museum and the Pérez Art Museum Miami have all been constructed along Biscayne Boulevard. 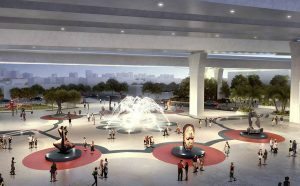 Bicentennial Park has been transformed from a derelict piece of land into beautiful Museum Park. 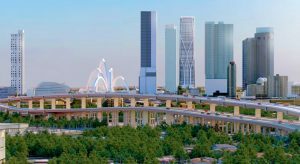 A row of condos has been built along Biscayne Boulevard, featuring world-class architecture. Interstate 395, though, was a remnant of the past. 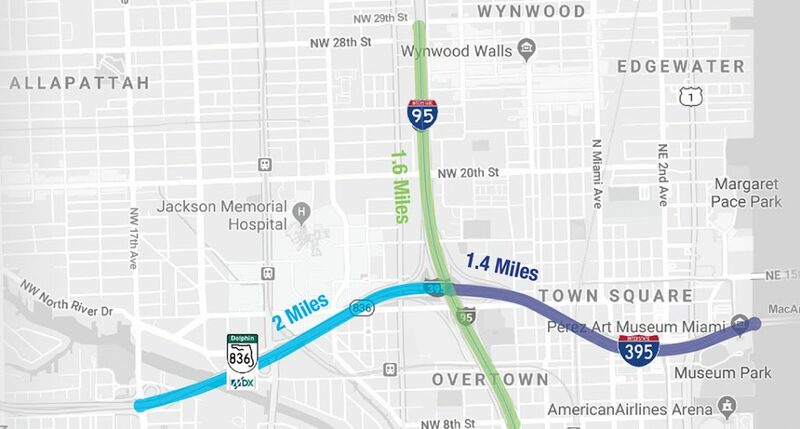 Not only is it functionally challenged for motorists, but it sliced through parts of Overtown. 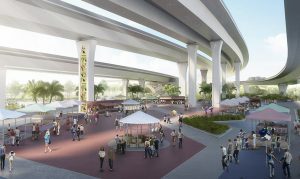 The new project will help ease the flow of traffic and help heal the destruction of a community with an array of public spaces and new pedestrian connectivity. The project has already started with survey work and some test pilings. Lane closures have already begun, typically at night. 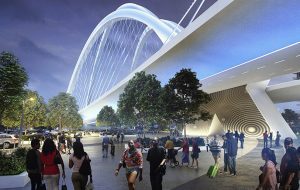 Construction is expected to be completed in the fall of 2023. 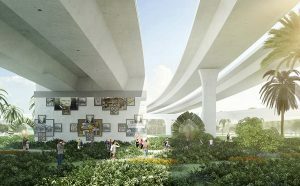 Check out the map below, a gallery of the project and a description of the highway reconstruction. The project starts with the double-decking of State Road 836. 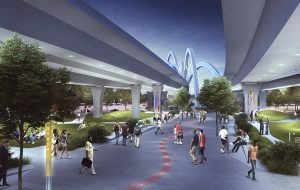 I-95 will be overhauled. 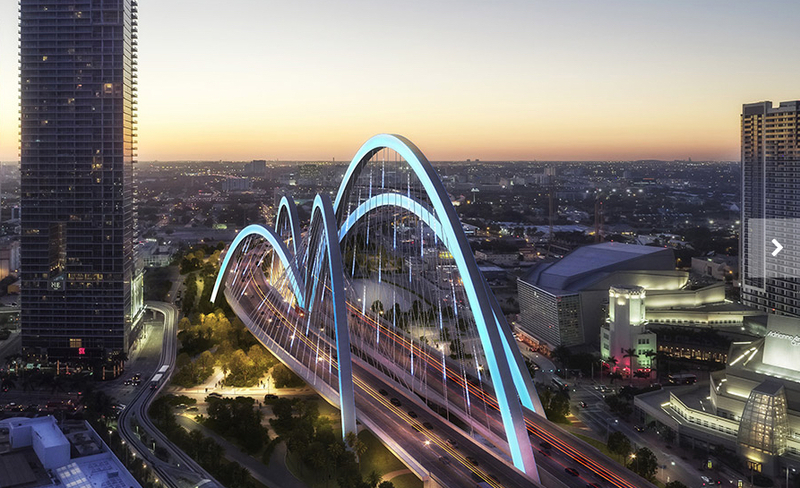 A new signature bridge will be created for I-395. This 1.4-mile part of the project will reconstruct I-395 and include the new 1,025-foot signature bridge, which will have six arches and run from Northeast Second Avenue to Biscayne Boulevard. 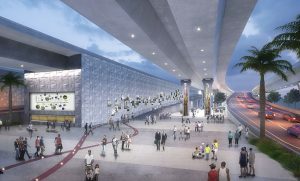 There will be three through lanes in each direction. 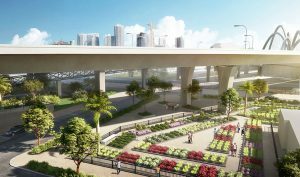 The existing I-395 eastbound off-ramps at NE 2 Avenue will be moved west to North Miami Avenue, and the westbound on-ramps at NE 1 Avenue will be shifted to the west of North Miami Avenue. 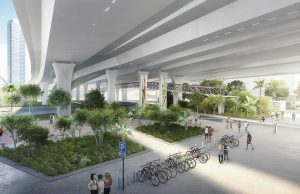 Northwest Second Avenue will also be reconnected under I-395. 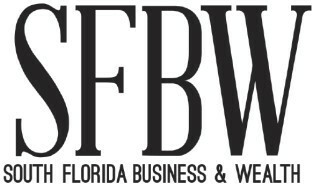 The pavement in both directions of I-95 will be replaced from NW Eighth Street to NW 29 Street. 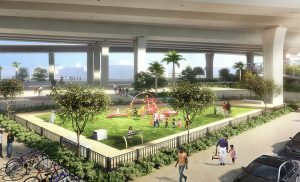 A new auxiliary lane along northbound I-95 will receive eastbound traffic from SR 836. 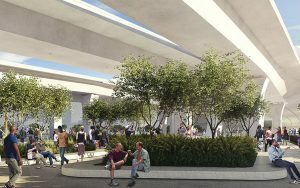 There will be a new connector ramp from southbound I-95 to westbound SR 836. 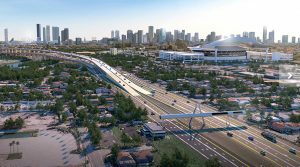 SR 836 will be double decked beginning just east of the toll gantry at NW 17 Avenue, rising over the center of SR 836, and touching down at I-395, east of the I-95 interchange. 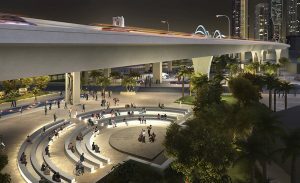 The double-decked section will provide drivers with a direct connection to the MacArthur Causeway without local entry and exit traffic. 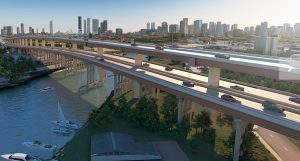 The existing SR 836 roadway and bridges will serve as a collector distributor system that allows drivers to enter and exit from the existing local roads and I-95. This collector distributor system will reduce the existing weaving movements resulting in enhanced safety and better traffic operations on SR 836. 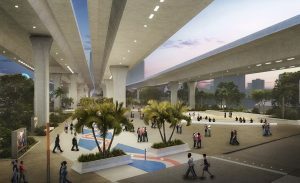 The eastbound SR 836 ramp to northbound I-95 will be widened to include an additional lane to reduce congestion.